Marco, Marc Orfaly’s Italian restaurant, opened in December 2010. 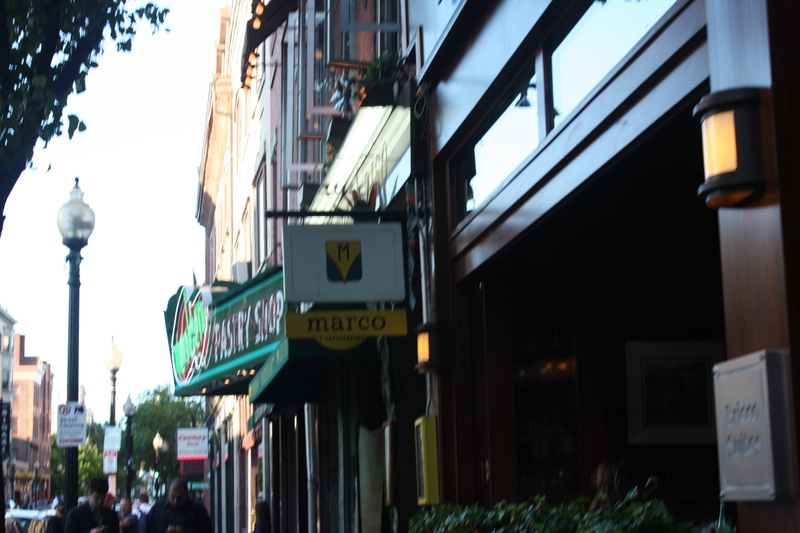 We have been meaning to visit Marco for sometime, which is situated before Modern Pastry. 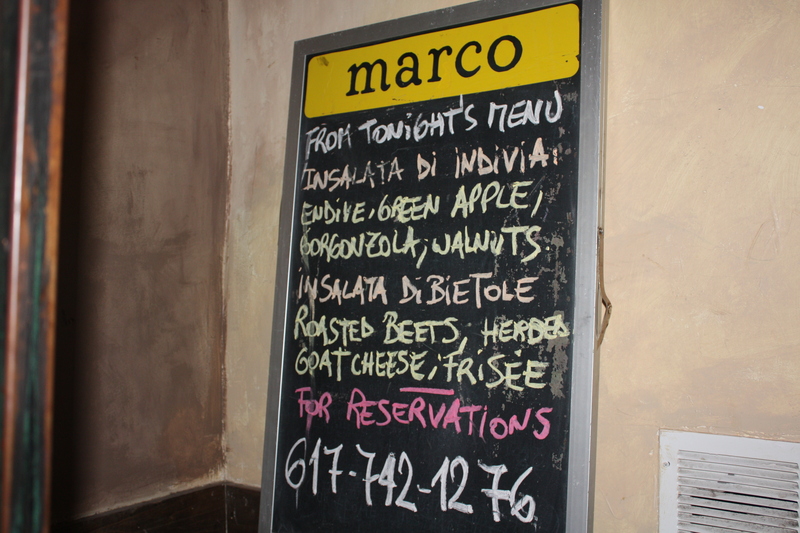 Marco’s second floor dining area is a private oasis on a normally hectic Hanover Street and North End. Once I saw this sign, I was debating which salad I should choose, endive with gorgonzola and walnuts or beets and frisee. Tough decision. 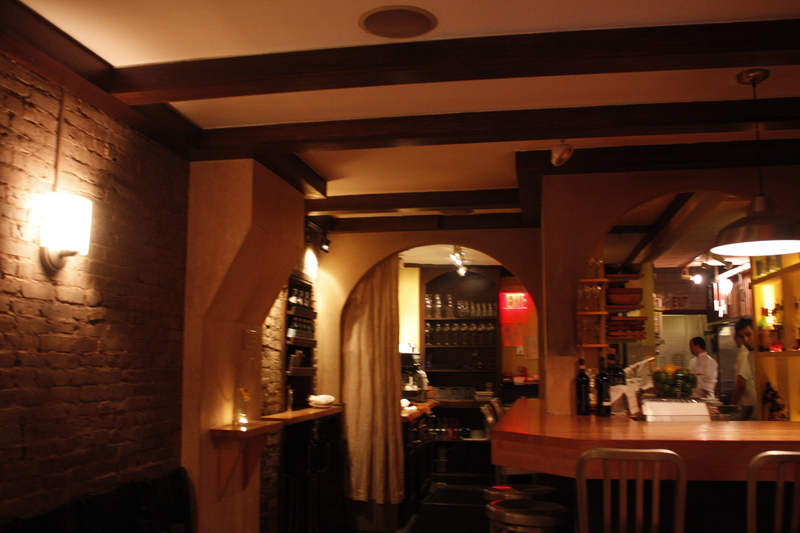 After climbing the stairwell and entering the restaurant, patrons face the open kitchen area and bar seating. 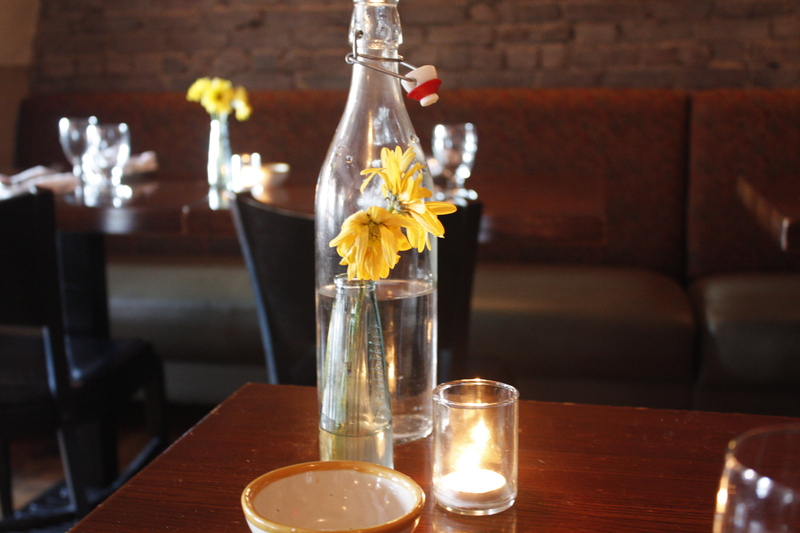 The restaurant was clean with exposed brick, leather seating and water bottles and tiny yellow flowers. 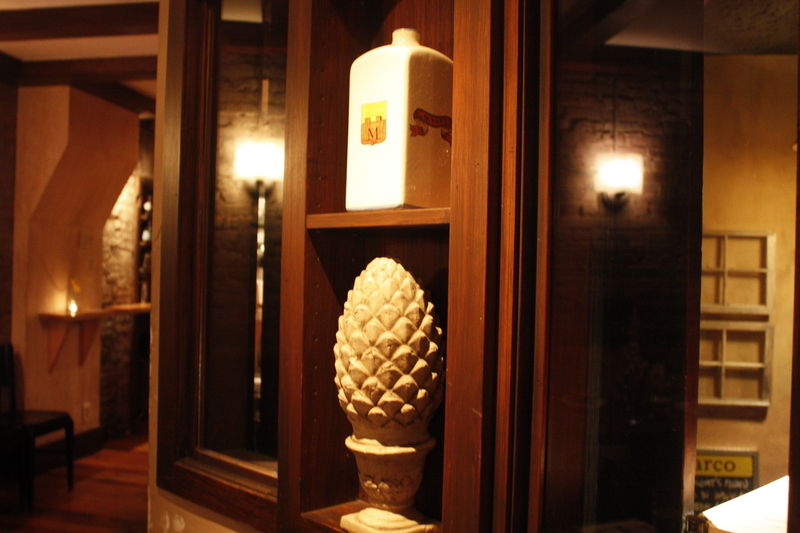 The low lighting and ceramic white jugs with the Marco insignia were clever. 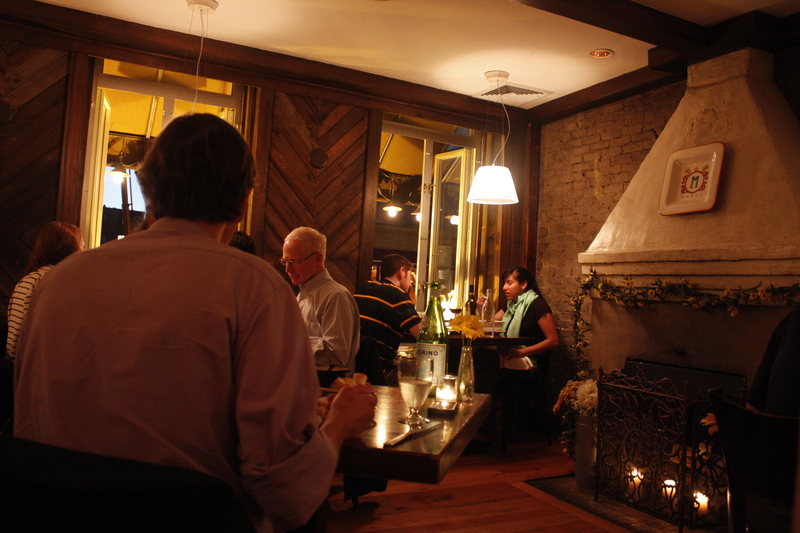 The dining room has approximately ten tables and a fireplace. The open windows, which overlook Hanover Street brought a pleasant cross breeze. 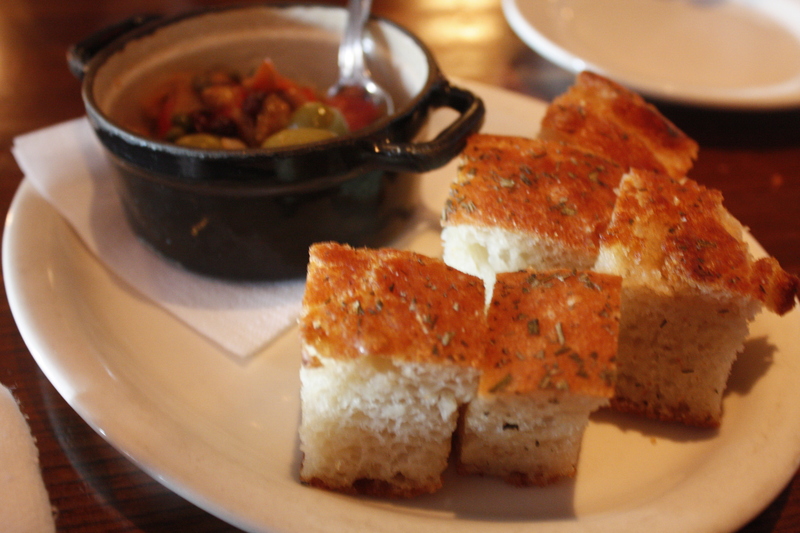 The meal started with complimentary focaccia bread topped with herbs, lovely flavor of olive oil and it was just amazing bread. It came with a a bit of olive oil and a mixture eggplant, capers, onion and olive in a mini cast iron ramekin. 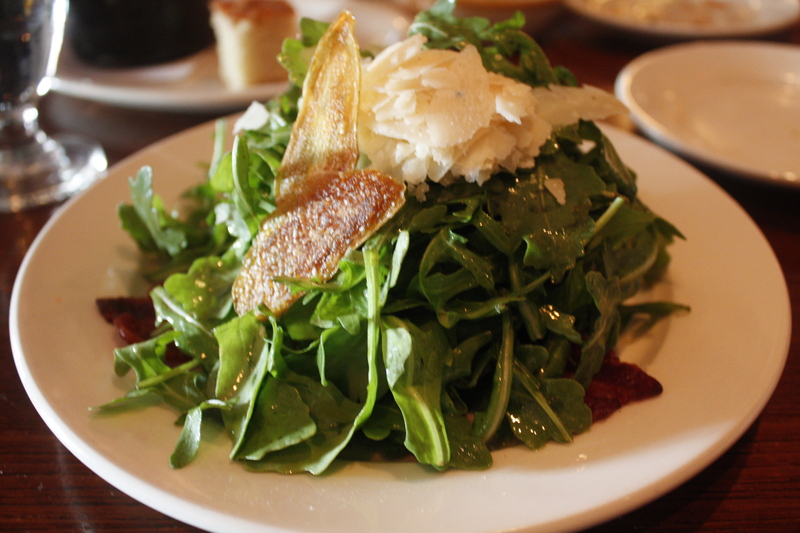 Instead of the endive or the beets, we sampled the Insalata di rucola, crispy bacon, shaved parmigiano, fingerling chips and lemon for $12. The arugula salad was light, bountiful and a great balance of salty and acidity. We wish there were a few more paper thin fingerling chips. 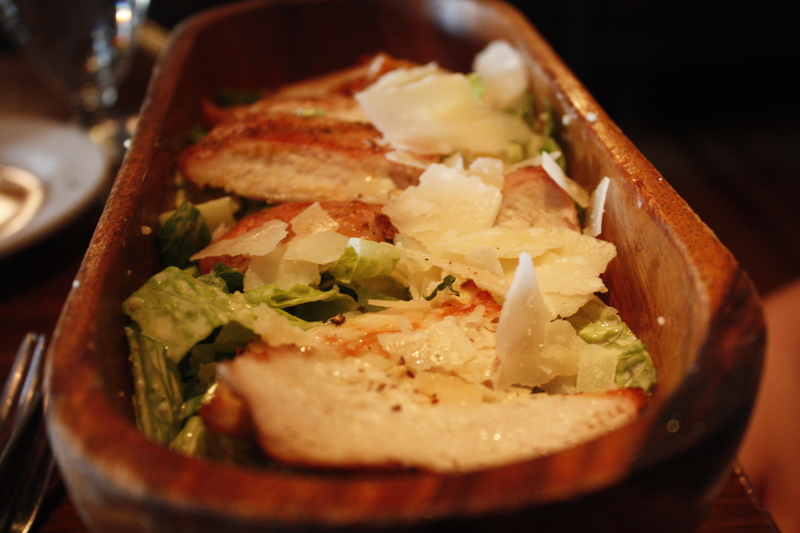 The caesar classico had parmigiano and focaccia croutons ($11) and a fresh, in-house made caesar dressing. For an additional $4, there was tender chicken seared with a nice crust. 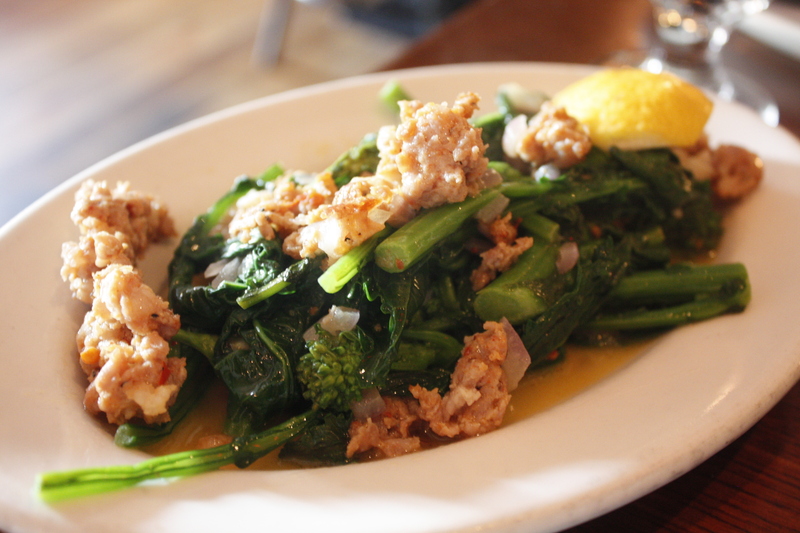 The broccoli rabe and sausage ($7) was absolutely delectable and the classic pairing was enhanced by the squeeze of lemon. 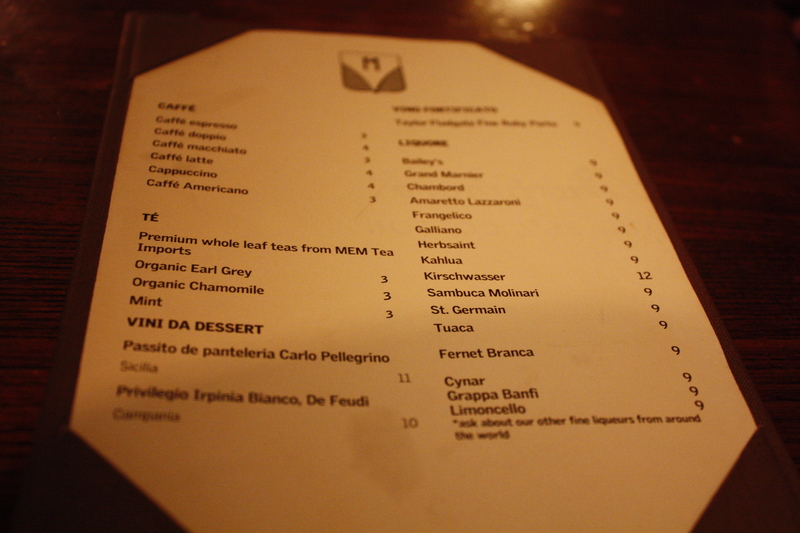 Marco serves M&M whole leaf tea and my dining companion had a pot of organic chamomile for $3. 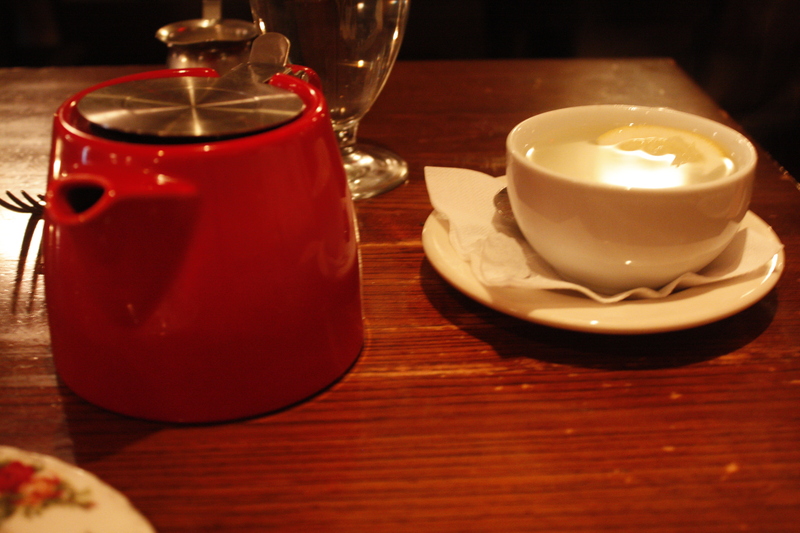 The tea itself steeped in an adorable red teapot. Love the teapots from Beehive. 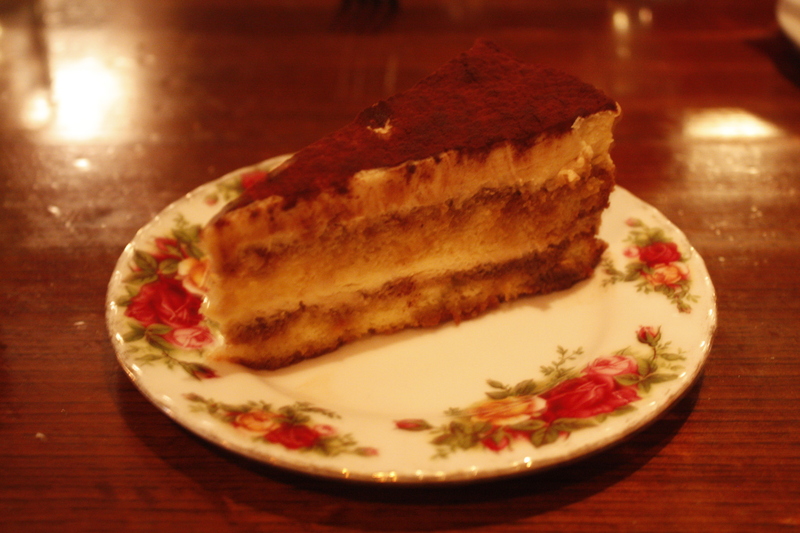 Although Marco serves gelato from downstairs, we had to share a slice of the house made tiramisu ($7). The tiramisu very lush and full of liqueur flavorful, but was more cake and less whipped cream and custard. We love the full cake flavor, with a generous portion of cream (BMH’s tiramisu). Looking forward to returning to Marco to sample the homemade ricotta cavatelli pasta, tagliatelle bolognese and funghi risotto. The service and ambiance were comfortable and relaxing, so we are excited to return.